In an earlier post, I compared and contrasted balance transfers and cash advances, which are very different financial instruments. 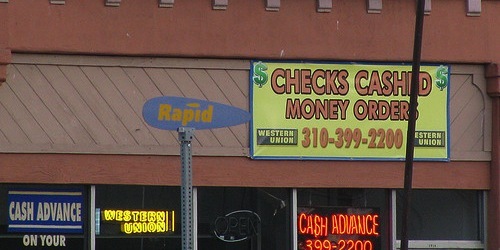 Put simply, credit card cash advances are an absolute last resort. Why? Well, for one they have sky-high interest rates. Don’t believe me? Look at any credit card’s pricing and terms section and you’ll quickly see what I’m talking about. The APR is typically well north of 20%, which means for every $100 you cash advance, you pay $20 in finance charges, using simple math. Carry the balance and it gets even worse. On top of that, credit card issuers begin charging interest on cash advances on the transaction date. So the day you elect to go with a cash advance, the interest starts accruing, unlike typical credit card transactions, which have a grace period after the billing cycle ends. Unfortunately, you may be reading this after realizing these harsh facts. You may be in a panic, thinking about how much the ill-fated cash advance will set you back. But fear not, there’s a simple way to alleviate your concerns. Credit card cash advances will show up on your credit card statement just like normal purchases, although maybe in a different section. And despite the important distinctions discussed above, a standard credit card payment will reduce the balance of the cash advance, just as it would any other charges. That said, if you’ve got a large outstanding cash advance balance, you can right your wrong by executing a credit card balance transfer. All you have to do is open a new balance transfer credit card, and pay off the credit card balance where you took out the cash advance. Imagine you have a Citi credit card with a $3,000 outstanding balance, with $2,000 in standard credit card purchases and $1,000 in cash advance charges. You could simply open a new balance transfer credit card and request that they move your $3,000 balance via the associated balance transfer offer. So using our example from above, you could move that entire $3,000 to a 0% APR balance transfer credit card for 15 months and avoid paying a balance transfer fee. For the record, I’m referring to the Slate No Fee Balance Transfer offer, the best balance transfer deal currently available. After making the balance transfer request while signing up for the Slate credit card, the $3,000 balance would eventually be transferred to your Slate credit card, and you’d enjoy 0% APR on the balance for 15 months. As a result, your old credit card balance at Citi, including the $1,000 in cash advances, would be entirely paid off, so you wouldn’t have to worry about the awful interest rate tied to the cash advance. It would be a thing of the past, and you could focus on paying off your new $3,000 balance with Chase, without being charged any interest for a long, long time. In summary, any charges you make on your credit card, whether they’re standard purchases, cash advances, or penalties, can all be paid off with a credit card balance transfer. Read more: Should I do a balance transfer?